I’ve learned from a friend that Old Sydney Town closed. I did a bit of research and learned that, indeed, a few years ago, due to money problems, it was closed to the public. However, it apparently lives on as a for-rent movie set. Nice to know they didn’t bulldoze it. That said, there is apparently some debate about whether the current owner will try to reopen (with a bit more marketing, so people know it’s there) or sell it for development. It would be a pity to lose it, though I do understand the concept of unloading a money-losing property. Having somehow reached a larger audience, Victoria’s Sovereign Hill is thriving. It seems that someone should be able to make a go of Old Sydney Town. I hope so. 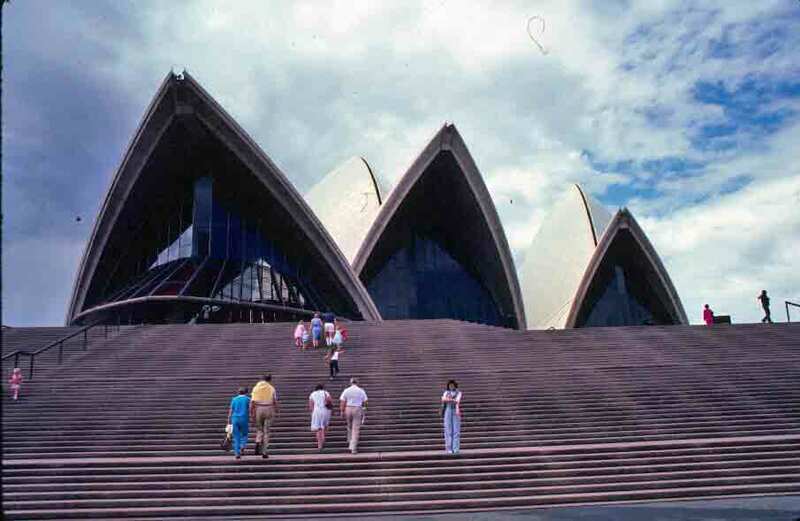 Here are a few more images from Old Sydney Town. Perhaps if you’re going to make a movie, these will entice you to rent the site. 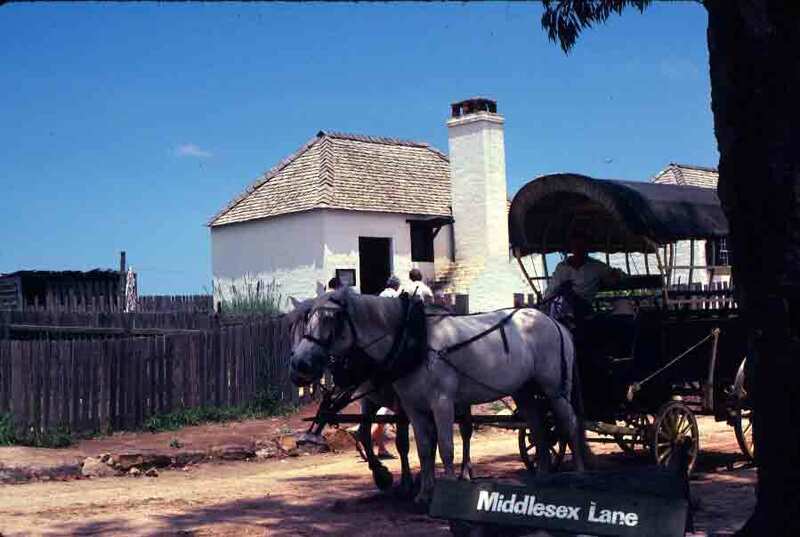 A lot of the early building styles in the new Australian colony reflected a combination of styles found in England and in England’s American colonies, but not all. 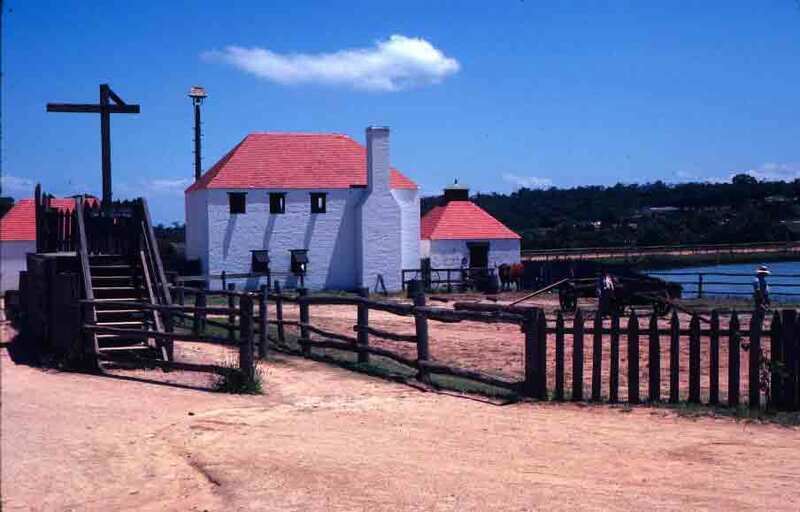 A few of the early types of construction are demonstrated in the row of officers’ quarters from Old Sydney Town shown below. 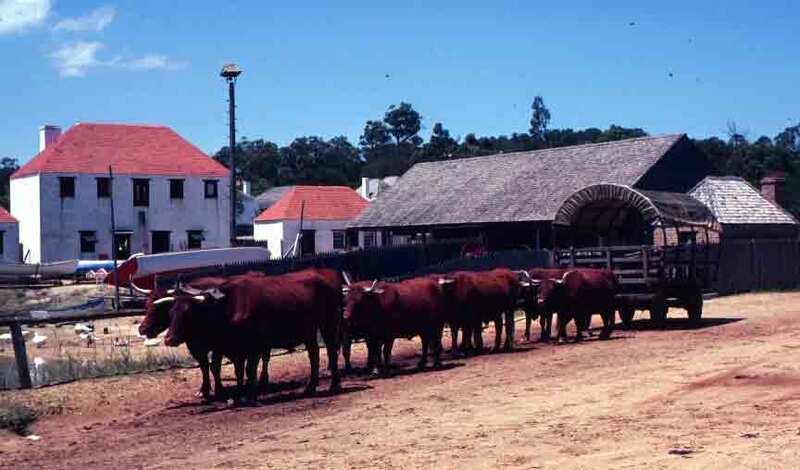 The one that I want to point out is the white log building at the back on the right. This is a style called drop-log construction. I actually just like the sound of the words, drop log. But I was also intrigued by the method. I’ve done a few searches on drop-log construction, and as far as I can tell, this is pretty much an Aussie concept. Anyone who knows me knows I love history. I spent a couple of years as a Revolutionary War re-enactor. I visit historic sites whenever and wherever I travel. I write history books for a living, including writing for the Colonial Williamsburg Foundation for a couple of years. It’s not the only thing I love, but it definitely tops the charts for me. History is dotted with remarkable people and events—and the most astonishing rarely make it into modern textbooks. It is also overflowing with fun, fascinating tales of how we got to where we are. Everything is far more interconnected than most people realize—and sometimes the connections are as interesting as the events themselves. The historic connections between the United States and Australia are numerous. It is not a mere coincidence that Australia was settled a very short while after Britain lost her American colonies. One had to have somewhere to dump the poor, political malcontents, and other undesirables. Once the United States shut the door, Australia (charted by Captain Cook in 1770) suddenly became far more interesting, and the British dashed off to claim it for themselves (arriving only a day before Britain’s perennial enemy, the French). British soldiers who had fought in the American Revolution now found themselves on the far side of the planet. The gold miners one associates with the California Gold Rush largely headed for Australia when gold was discovered near Melbourne. Going the other way, convicts who escaped from Australia headed for the United States—and often did quite well once there. A good example of this is Irish rebel Thomas Meagher, who was convicted of sedition in Britain and sent to the penal outpost in Tasmania (known then as Van Diemen’s Land). Escaping Tasmania, he headed for the U.S., where he joined the Union Army during the Civil War and ended up a Brigadier General and, later, governor of the Montana Territory. It was this love of history that drew me to Old Sydney Town, a sprawling recreation of Sydney during the terms of the new colony’s first five governors. 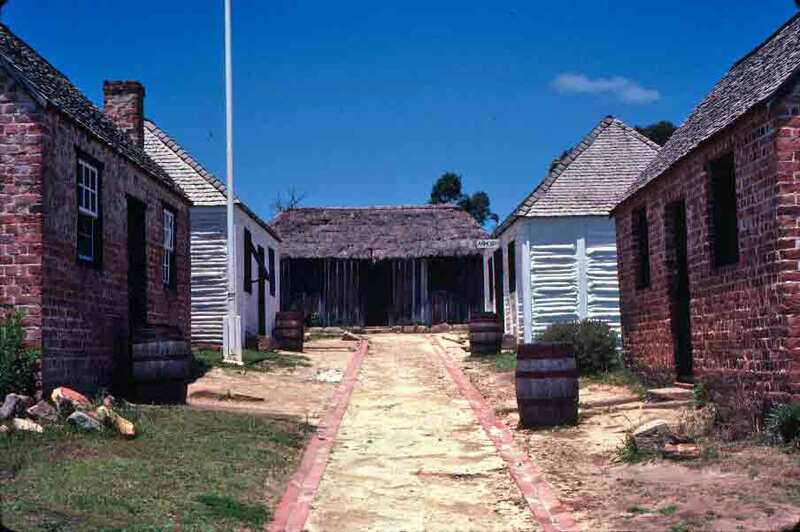 Of course, for most of this period, the colony was known as New South Wales, as it wasn’t until the fifth governor arrived that it got named Australia. Hence, the British soldiers stationed in the colony were known as the New South Wales Corps. That’s enough for today—more about this splendid place in the next post. 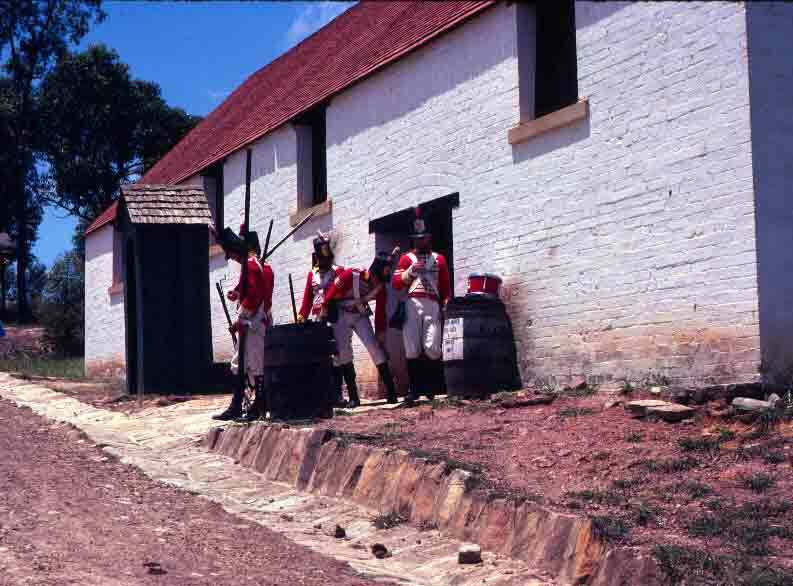 But here’s a photo of a few of the British redcoats known as the New South Wales Corps, outside their barracks in Old Sydney Town. In my book, I mention wrapping an arm around a tree and leaning out over a cliff to take a photo of a king parrot I saw while visiting Katoomba. The photo I took is below. But what amazes me when I think about it is the things I do when a camera is placed in my hands that I would never consider without a camera. Close-ups of bees, hanging over cliffs (not just here, but as mentioned in my post on the Annan River Gorge), leaping in front of running horses or athletes. Somehow, the shot becomes the priority when I’m holding a camera. Of course, this is fading a bit as I age—I have a greater appreciation of the possibility of injury or death. But it is not gone. Judging by the images I see in such outlets as National Geographic or Outdoor Photographer, I know I am hardly alone in this. It seems to characterize a wide range of photographers. I think it has to do with the fact that the photographer is even more focuses than the camera. The king parrot is a splendid orange and emerald bird. 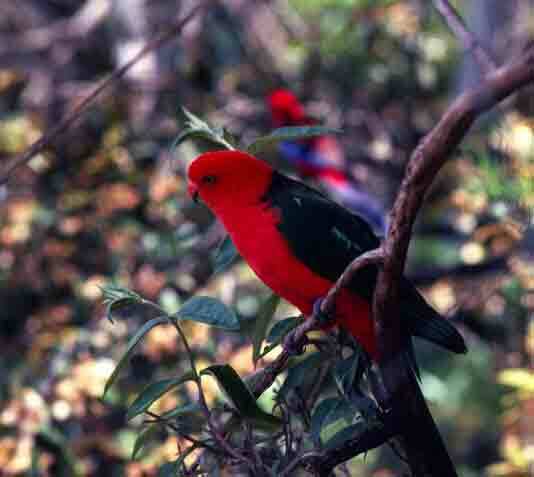 The bright splash of color behind the king parrot is a crimson rosella, another beauty of this region. But the rosella appears in a previous post, so this time, it’s the king’s turn.